The Inaugural winner of the British River Price is announced and the RRC celebrates its 20th anniversary. The RRC have been on the road attending workshops and site visits in Newcastle, Norfolk and Rhondda. The England River Prize finalists are announced and the Nene is restored through Peterborough. RRC provide advice in Shetland to secure the future of the freshwater pearl mussel. Training workshops and river prize deadline. The RRC becomes the host for an information hub for designated rivers in partnership with the Environment Agency and Natural England. REFORM review the effects, costs and benefits of restoration, whilst SEPA publish new flood maps for Scotland. Following recent floods, flood risk management is discussed. The inaugural British River Prize is also announced and the RRC now oversee the RiverWiki case study database. RESTORE Layman's report is published as is the RRC's weir removal report. The importance of national river restoration centres is outlined and the RiverWiki of the month is the Nirth diversion in Scotland. The RRC support the Catchment based approach partnership (CaBA) in England. 100 case studies are now on the Webmap and river restoration featured in the news. The European River Restoration Conference celebrated successes and addressed challenges in restoration. Elsewhere Homersfield sluice was removed and theres been an incredible recovery in wild fish numbers on the Isle of Wight. The RRC update the manual of techniques by adding 17 new techniques to the 2002 manual. A new online resource for flood managers is released and a weir bypass channel is created in Yorkshire. 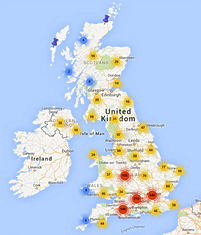 The RRC launch a new UK Web Map of restoration projects. There are also outputs from RESTORE and RRC workshops as well as a video of weir removal in action.